44in W x 30in H Acrylic Backboard with Blow-Molded High-Density Polyethylene Frame and Clear Playing Surface / Fade-Resistant Graphics. 18in Classic Rim of 5/8in Solid Steel with 1/2in Steel Braces and 50g Net. 3-Piece, Black 3in Round Powder-Coated Steel Pole. 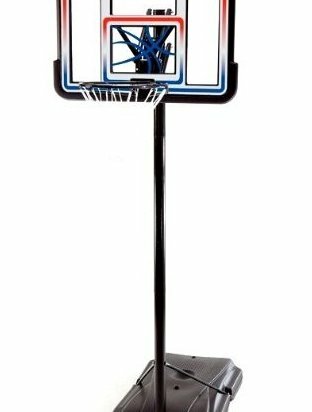 Quick Adjust II Height Adjustment Allows You to Adjust the Backboard from 8ft to 10ft with the Use of a Broomstick. 31-Gallon Roller Base.